The Scout Association has declared 2015 to be the ‘Year of Adventure’ for Cub Scouts and are encouraging Packs to give their Cubs the opportunity to do more adventurous activities this year. As a Pack, we already do a lot of the suggestions that were on the recommended list but to give the more adventurous Cubs an opportunity to do something different, we arranged a day out at a High Ropes Course and invited our Scouts to join us. 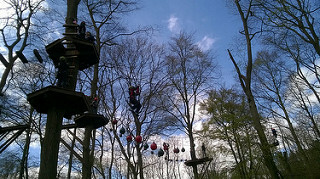 Once all the youngsters and Leaders were kitted out in their safety harness and helmet, they received a very comprehensive safety briefing by Tree Ninja’s specially trained instructors including how to work the safety equipment, which ensures that the participant is permanently attached to a safety line at all times. Putting instructions into practice then followed when everyone went on to a short course just a few feet off the ground to practice using the safety equipment, by which time everyone was raring to go to tackle the course. The five courses were two, four, six, eight and ten metres off the ground and included a wonderful array of obstacles to negotiate before descending each course by Zip Wire. The Cubs, Scouts and Leaders worked their way around the five courses in small groups with the Leaders encouraging and helping the less confident youngsters when required. It was also nice to see the Scouts, without any prompting from the adults, take a less confident Cub under their wing and help and encourage them around the course. The Tree Ninja staff were extremely pleasant, encouraging and helpful, not only during the safety briefing but during the course of the day as well, as they marshalled the courses from the ground and made sure there were no problems. There were also four other Leaders encouraging from the ground and from their viewpoints, they could see how many of the youngsters were increasing in confidence as they progressed around the course with some conquering the fears that they had had about doing the course or tackling some of the more difficult obstacles. A wonderful enjoyable activity in a superb forest setting, and, as a bonus, perfect weather conditions of warm sunshine and a very slight breeze. A good time was had by all!